Introduction: Nutraceuticals although is a widely accepted term and now well understood, there exists several nomenclature and definitions across the countries. The present article discussed the progression of Indian food product regulations over the years, mainly emphasizing on regulations of nutraceuticals and dietary supplements. 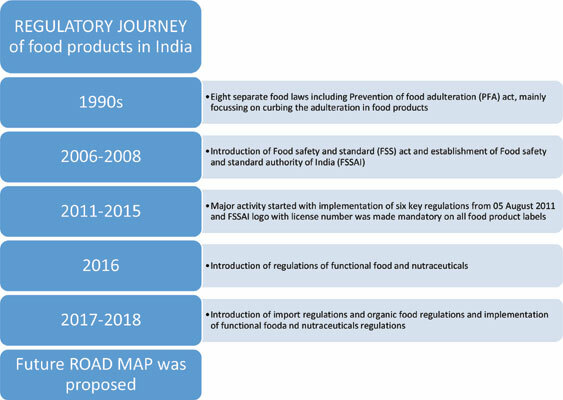 Regulatory Progression in India: The regulatory structure of nutraceuticals in India has evolved after the establishment of Food Safety and Standard act in 2006, which brought together preexisting eight laws to one single law regulated by Food Safety and Standard Authority of India (FSSAI). After the introduction of this act, the regulatory framework of food products progressed year by year with continuous amendments to this Act. The major milestone in the field of nutraceuticals was in 2016 with the introduction of regulations of functional food and nutraceuticals. Under these regulations, various guidelines were laid down for nutraceuticals in terms of their safety standards, health claims along with permissible limits of active ingredients and excipients for the safe and effective use. Conclusion: India has progressed in the development of a strong regulatory framework for nutraceuticals; however, to effectively implement these guidelines and for ensuring the safe and nutritious food, a robust system and a better-coordinated actions are required. Keywords: Amendments, dietary supplement, FSSAI, functional foods, herbal nutraceuticals, regulations. Keywords:Amendments, dietary supplement, FSSAI, functional foods, herbal nutraceuticals, regulations. Abstract:Introduction: Nutraceuticals although is a widely accepted term and now well understood, there exists several nomenclature and definitions across the countries. The present article discussed the progression of Indian food product regulations over the years, mainly emphasizing on regulations of nutraceuticals and dietary supplements.